Such a beautiful light and frame for this jewel, Takami. I had to come back and check out this shot for a second time when I saw the title pop up in my reader. I’m still amazed by the colors. Hope your week-end is somewhat dryer than mine. Have a great one at any rate. Thank you my friend! It means a lot to know you enjoyed re-visiting my photos. There is no greater compliment than that. It was dryer this past weekend, but suddenly turned chilly. Hoping Lady Spring will arrive and stay soon. Wishing you a great week ahead. The Lady is certainly being fickle on this side of the water this year also. Though we’ve now had 2 days in a row with SOME sun, we still haven’t had 2 completely sunny days consecutively. And the temperatures have not yet encouraged anyone but the most fearless to lighten their clothing by any great degree. But no one is launching any nukes, so I guess everything is alright (I try my best to be easy to please). Thank You commenting so nicely my newest post. Your photo is gorgeous! It has wonderful colors. I do love it. Thank you Sartenada. I hope you and your wife had a happy new year in your new home. This birdie is extremely beautiful… and strong in order to deal with the cold weather! 😉 sending much love, dear Takami!!!! Thank you for nominating my humble site. Wonderful! Would make a lovely greetings card. All the best for 2017! What a jewel, indeed. Happy New Year ! Thank you Sylvie! He is a beautiful bird 🙂 Happy New Year to you too. Wow, you capture the depth of the New Year so well with this photo ~ a feeling of winter, but with it the expectation of the warm spring breezes that are going to arrive soon. Wishing you and your family a great start to 2017, nothing like a little move and setting up a ‘new life’ to get the blood flowing and hoping you are enjoying your surroundings 🙂 Take care Takami, and hopefully we will be able to catch up sometime this year. Cheers! Thank you Randall! Last year was full of ups and downs, but Nature shows that Life does go on and there can be positive things even during the darkest times. I hope we can catch up this year – that would be awesome 🙂 In the meantime, take good care and our best wishes always. I love the soft colours of this beautiful picture ! Thank you Gin! I hope you and yours had a very happy new year! Thank you dear Jeannie! We hope you and your partner had a lovely start to the new year too! 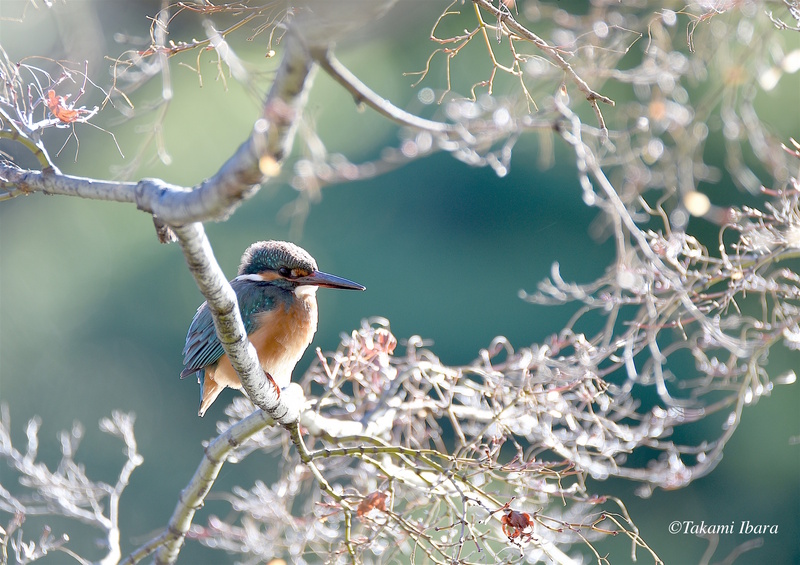 I’ve discovered that there are some resident kingfishers in a park right near my workplace (!) and have made it my business to go as much as my schedule permits 🙂 I’m excited like a child each time 🙂 There are some veteran photographers who stop by regularly and they’ve been very kind in sharing tips and good conversations. I hope 2017 will be an amazing one for you and all you hold dear!! I almost forgot…a very Happy New Year to you and your husband from the other side of this giant puddle that sits between us. May 2017 bring you much happiness and joy. When I clicked on your gorgeous picture, the sudden brilliance of the colors on my screen actually sat me back a few centimeters. Amazing! I can only dream of clarity like that in my pictures. You are a Maestro of the photographic field my friend. The year started off with the news that I will be moving into a slightly larger living area, upgrading from my little bachelor suite to a one-bedroom. The extra space will be much appreciated, and the new area is a little bit further from the central hub that I’ve called home for the past 10 years or so. The additional serenity is something I’m truly looking forward to, so all-in-all, I would say the New Year is off to a good start. Thank-you for asking. What a beautiful little jewel! Happy New Year! Thank you Mr Nicodemas. I’m especially thinking and praying for you, your family and country in the upcoming days. Thank you Takami, we really appreciate your prayers! These are difficult times for our country. Thank you Mr Nico. It’s a troubling time for all of us, and as your beautiful writing often expresses, we (the people) need to support and love each other. Blessings and peace. Peace to you and yours my friend and be blessed! Another winning photo, just perfect! Hello my friend! Thank you so much for your feedback. I feel like I’ve won a prize 🙂 I hope you and your family are doing well, and always look forward to your posts.